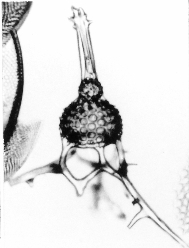 Lophocyrtis (Lophocyrtis) exitelus has a strongly developed apical spine with thorns near the distal end and arches at the base where it joins the cephalis. Cephalic wall perforated by 20-30 small circular to subcircular pores. Collar stricture marked by a distinct change in contour. Some specimens have a single row of larger pores just below the collar stricture. Thorax approximately hemispherical with a rough to thorny surface. There are about 16 to 31 pores around the greatest circumference. Abdomen reduced to a single row of large pores, followed in some specimens by a delicate subcylindrical part attached to the three to six widely divergent feet (Plate 1, 4 ). In most specimens there are only thorns on the feet marking attachments of this rarely preserved lattice (Plate 1, 2 ). The single row of large pores seems to be equivalent to a similar row in the ancestor L. (L.) jacchia, where the proximal abdominal pores are larger than the others. Three to six widely divergent feet, round in cross-section and no differentiated peristome.